Baoviet Holdings – The leading financial and insurance group in Vietnam has won The best transparence sustainability report at the 4th Asia Sustainability Reporting Awards (ASRA) concluded in Singapore. ASRA is the highest recognition for corporate reporting in the region. The amendments to the Law on Enterprise and Law on Investment must include stronger solutions to thoroughly and comprehensively reform State-owned enterprises (SOEs) and enhance their efficiency, according to the Vietnam Association of Financial Investors (VAFI). Director of the US Agency for International Development (USAID)’s Environment and Social Development Office Christopher Abrams has suggested Vietnam should pool domestic resources to develop renewable energy and import natural gases to increase their supply in the future. A forum took place in Hanoi on March 16 to discuss the role of the press in linking the business community with the Government in the context of the Comprehensive and Progressive Agreement for Trans-Pacific Partnership (CPTPP) officially taking effect on December 30 last year. Southern localities of Vietnam has been a major destination for investment from the Republic of Korea (RoK) in recent years, and local textile-garment and footwear industries have proved to be a magnet for an influx of capital from this country. 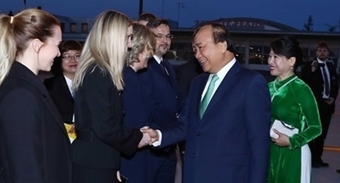 The Vietnamese Government will create optimal conditions for US enterprises to invest successfully in Vietnam and is willing to listen to their recommendations to improve the local business environment, said Prime Minister Nguyen Xuan Phuc. Vietnam and Singapore will expand cooperation in innovation and technology – a new area in the bilateral economic partnership that was recommended at the 14th ministerial meeting on economic connectivity between the two countries. Vietnam aviation authority says no operational certificates will be granted to Boeing 737 MAX 8 aircraft over safety concerns. Google will support Vietnamese startups with cloud services worth up to $100,000 each to help them go global. Deputy Prime Minister Vuong Dinh Hue recently requested that ministries, sectors, and localities speed up the allocation of public investment, amid the slow disbursement of public investment in the first two months of 2019. More than 50 leading US companies operating in different industries will arrive on March 12 to explore business opportunities in Vietnam, the US-ASEAN Business Council (USABC) has announced. Coffee production areas across many Vietnamese provinces, including Dak Lak, Dak Nong, Son La and Lam Dong, are endowed with crop varieties, weather conditions and soils that are suitable to develop specialty coffee, according to experts. Deputy Prime Minister Truong Hoa Binh cut the ribbon to inaugurate the Srepok 1 and Quang Minh Solar Power Plant Complex in Buon Don district in the Central Highlands province of Dak Lak on March 9. A Coffee Trade Fair kicked off in Buon Ma Thuot city in the Central Highlands province of Dak Lak on March 9, as part of the ongoing 7th Buon Ma Thuot Coffee Festival. The Vietnam-Russia oil and gas joint venture Vietsovpetro held a ceremony in the southern province of Ba Ria-Vung Tau on March 8 to welcome the first flow of oil it pumped up from Ca Tam field. The Ministry of Industry and Trade (MoIT) is keeping a close watch of the pork market and will promptly take measures to ensure supply amidst concerns about possible shortage due to outbreaks of African swine fever (ASF) in northern localities. In recent years, many foreign fruit exporters have entered Vietnam to take advantage of local people’s rising popularity of imported fruit in the country.